The US Department of the Interior has authorized America’s largest wind energy project to be built in Wyoming, south of Rawlins. 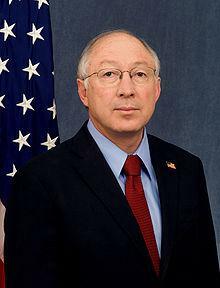 Interior Secretary Ken Salazar visited Laramie County Community College in Cheyenne this morning. He authorized the Chokecherry and Sierra Madre Wind Energy Project, which would cover almost 220,000 acres and generate up to 3,000 megawatts of power. Salazar says he’s proud that the project has put the Department over its goal to generate 10-thousand megawatts of renewable energy on public land in 2012. LCCC president Joe Schaffer says many graduates are being hired by foreign companies, because wind power has seen public support abroad. “This project shows great promise, not only for being able to keep our students, our graduates, here domestically, but right here in Wyoming as well,” Schaffer says. Secretary Salazar says he and President Obama are pressing Congress to support a tax break for wind energy to help that industry thrive in the United States. Erik Molvar of the Biodiversity Conservation Alliance says his group supports wind energy, but not the location for his project. He says the wind farm will disturb core sage grouse habitat, and could also become one of the most deadly wind project ever for birds of prey, including golden eagles. Salazar says the Bureau of Land Management and the US Fish and Wildlife Service are working with the Department of Interior to preserve habitat as effectively as possible.